A widget which arranges its children in rows and columns. Whether all children of the box are given equal space. How many space in pixel are between rows. How many space in pixel are between columns. Space in pixel between the children and the border of the widget. Shadow type of the frame. List of source targets (e.g. text/plain or application/x-color) which are supported. List of destination targets (e.g. text/plain or application/x-color) which are supported. Message that appear next to this widget when the mouse pointer is held over it for a short amount of time. %h help type: either "whatsThis" or "tooltip"
Name of the widget, can be used to set options in an rc file. Whether or not the item is visible. Whether or not the item is sensitive to user input. The -heightGroup option can be an arbitrary string. All widgets with the same heightGroup request the same height. If packed with the fill flag set, they will have nevertheless different heights. The -widthGroup option can be an arbitrary string. All widgets with the same widthGroup request the same width. If packed with the fill flag set, they will have nevertheless different widths. The -sizeGroup option can be an arbitrary string. All widgets with the same sizeGroup request the same size. If packed with the fill flag set, they will have nevertheless different sizes. 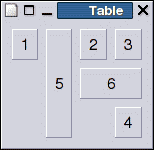 The Gnocl table widget is a combination of the GtkTable and, if necessary, the GtkFrame widget. The frame options can only changed via configure if at least one frame option was given on creation of the table. If the children are scaled or aligned each child is embedded in a GtkAlignment widget. Deletes the widget and the associated tcl command. Configures the widget. Option may have any of the values accepted on creation of the widget. Add widgets at a new row to the table. If a widet-ID is the empty string ("") the corresponding column is left empty. Whether the widgets is to be given extra space allocated to table. The extra space will be divided evenly between all children of table. If expand is a list, the first value is for the horizontal and the second for the vertical expansion. Determines whether the allocated space is actually used. The values can range from 0 (meaning the child uses its minimum size) to 1 (meaning the child fills all of the available space). If fill is a list, the first value is for the horizontal and the second for the vertical expansion. The number of pixels to put between the widgets. How many rows a widget should occupy. Alignment of of the widget in the space allocated in the table. This option has only an effect if the fill option is not 1. Same as add but adds a new column. If an widget-ID of the list is the empty string the corresponding row is left empty. Instead of -rowSpan an option -columnSpan exists. How many columns a widget should occupy. Adds the widget with the ID widget-ID at a given row and column. Row and column must be either an integer or "end[+-offset]". The first empty row or column is labeled "end", the row/column before "end-1" etc. All options of the addRow and addColumn command are valid.